Third-quarter and first nine months 2017 accounts reflect the acquisition of the former Boehringer Ingelheim Consumer Healthcare (CHC) business and the disposal of the Animal Health business (completed on January 1, 2017(4)). In accordance with IFRS 5 (Non-Current Assets Held for Sale and Discontinued Operations), Animal Health results in 2016 and gain on disposal in 2017 are reported separately. 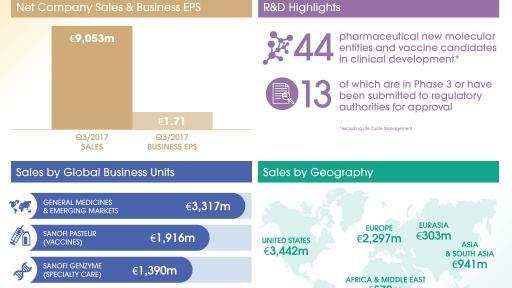 Third-quarter and first nine months 2017 income statements also reflect the consolidation of European operations related to Sanofi vaccine portfolio, following the termination of the Sanofi Pasteur MSD joint venture (SPMSD JV) with Merck at the end of 2016. 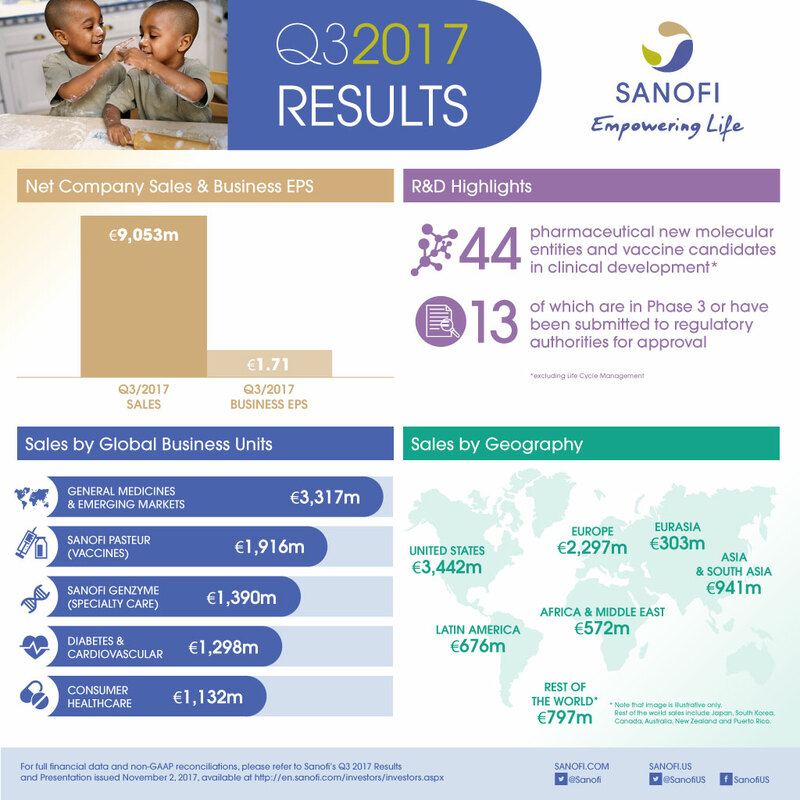 (1) In order to facilitate an understanding of operational performance, Sanofi comments on the business net income statement. Business net income is a non-GAAP financial measure (see Appendix 8 for definitions). The consolidated income statement for Q3 2017 and 9M 2017 is provided in Appendix 3 and a reconciliation of IFRS net income reported to business net income is set forth in Appendix 4; (2) changes in net sales are expressed at constant exchange rates (CER) unless otherwise indicated (see Appendix 8); (3) CS: constant structure: adjusted for BI CHC business, termination of SPMSD and others; (4) The closing of the disposal of Merial in Mexico is expected in 2017; (5) See definition page 8; (6) 2016 Business EPS was €5.68; (7) Collaboration with Regeneron. Net sales were €9,053 million, up 0.3% on a reported basis and 4.7%(2) at CER reflecting the change in scope of the CHC and Vaccines Global Business Units (GBUs). At CER and CS(3), net sales were stable (-0.2%). Sanofi Genzyme grew 13.9% at CER due to the strong U.S. launch of Dupixent® and good growth in Multiple Sclerosis. 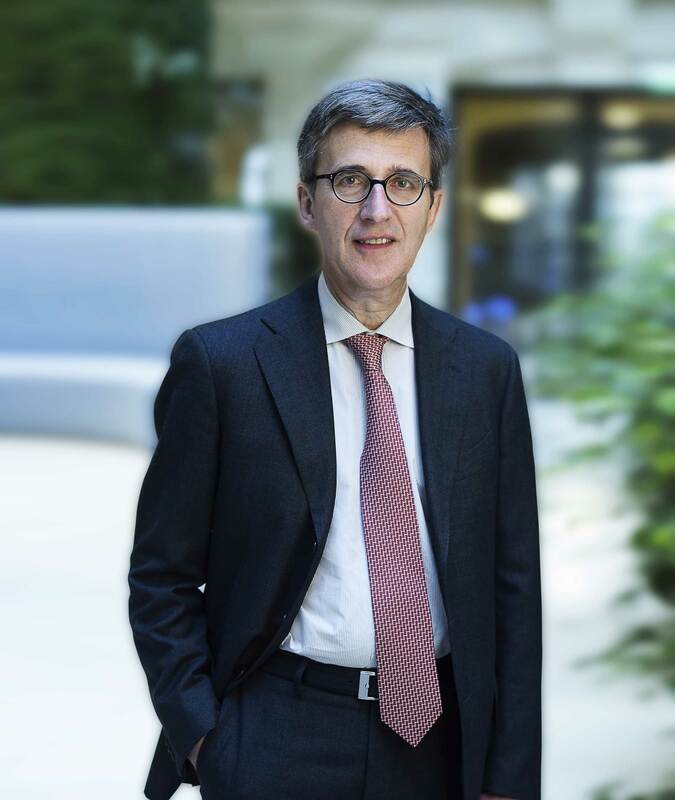 Sanofi Pasteur grew 7.2% at CER and CS largely driven by pediatric combinations and booster vaccines. CHC sales were up 1.0% at CER and CS impacted by increased competition in developed markets. Diabetes and Cardiovascular sales declined 14.8% at CER. Given increased visibility on sales performance, Sanofi refines its global Diabetes franchise outlook to -6% to -8% CAGR over 2015-2018 at CER. Emerging Markets(5) sales increased 7.3% at CER and CS driven by strong contributions from China and Russia. Q3 2017 business operating income of €2,911 million, up 5.1% at CER and +1.7% at CS. Q3 2017 business EPS(1) grew 1.1% at CER to €1.71 and decreased 4.5% on a reported basis. Sanofi continues to expect 2017 business EPS(1) to be broadly stable(6) at CER, barring unforeseen major adverse events. Currency impact on 2017 business EPS is estimated to be -1% to -2% at the average September 2017 exchange rates. Dupixent® approved in the EU in moderate to severe atopic dermatitis. Positive topline results of the Phase 3 QUEST and VENTURE studies confirmed the safety and efficacy profile of dupilumab in asthma; U.S. filing in persistent uncontrolled asthma expected to take place in Q4. In immuno-oncology, FDA granted Breakthrough Therapy designation status to cemiplimab(7) (anti PD-1). In September, the European Commission granted marketing authorization for Dupixent® (dupilumab), for use in adults with moderate-to-severe atopic dermatitis who are candidates for systemic therapy. In September, the U.S. Food and Drug Administration (FDA) granted Breakthrough Therapy designation status to cemiplimab (REGN2810/SAR439684) for the treatment of adults with metastatic cutaneous squamous cell carcinoma (CSCC) and adults with locally advanced and unresectable CSCC. Cemiplimab is an investigational human, monoclonal antibody targeting PD-1, being jointly developed by Sanofi and Regeneron. In September, the FDA granted tentative approval for Admelog® (insulin lispro) 100 Units/mL, a rapid-acting human insulin analog. Sanofi filed a paragraph IV certification and Eli Lilly did not file a suit against Sanofi within the 45 days period under Hatch-Waxman Act. 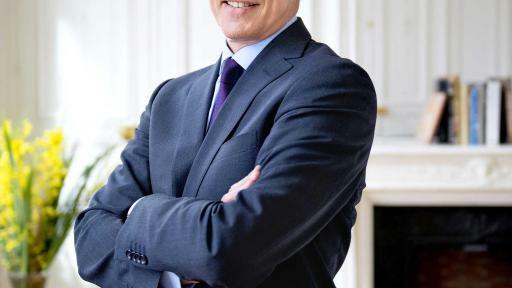 Sanofi is currently working closely with the FDA in order to receive full approval for Admelog in order to launch in the U.S.
At the end of October 2017, the R&D pipeline contained 44 pharmaceutical new molecular entities (excluding Life Cycle Management) and vaccine candidates in clinical development of which 13 are in Phase 3 or have been submitted to the regulatory authorities for approval. In October, Sanofi and Regeneron announced that the Phase 3 investigational study, LIBERTY ASTHMA VENTURE, evaluating dupilumab in adults and adolescents with severe, steroid-dependent asthma met its primary endpoint and key secondary endpoints. The study results showed that dupilumab significantly reduced steroid use, asthma attacks, and improved lung function. 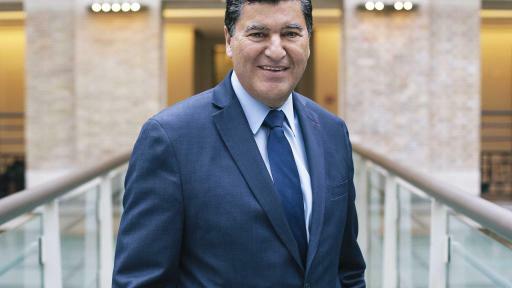 In September, Sanofi and Alnylam reported positive topline results from the APOLLO Phase 3 study of patisiran in hereditary ATTR (hATTR) amyloidosis patients with polyneuropathy. This study met its primary efficacy endpoint and all secondary endpoints. 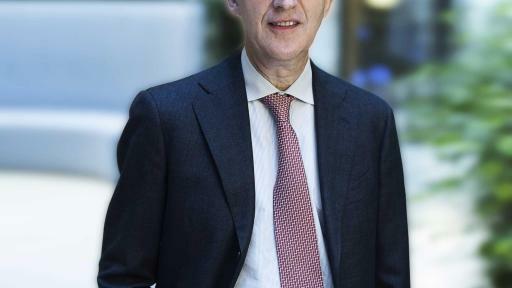 In September, Sanofi and Regeneron announced positive results of the Phase 3 CAFÉ study for Dupixent® in patients with moderate-to-severe atopic dermatitis who are inadequately controlled with or intolerant to the broad immunosuppressant drug cyclosporine A (CSA), or when this treatment is medically inadvisable. The results of this study were presented at the European Academy of Dermatology and Venerology (EADV) Congress. 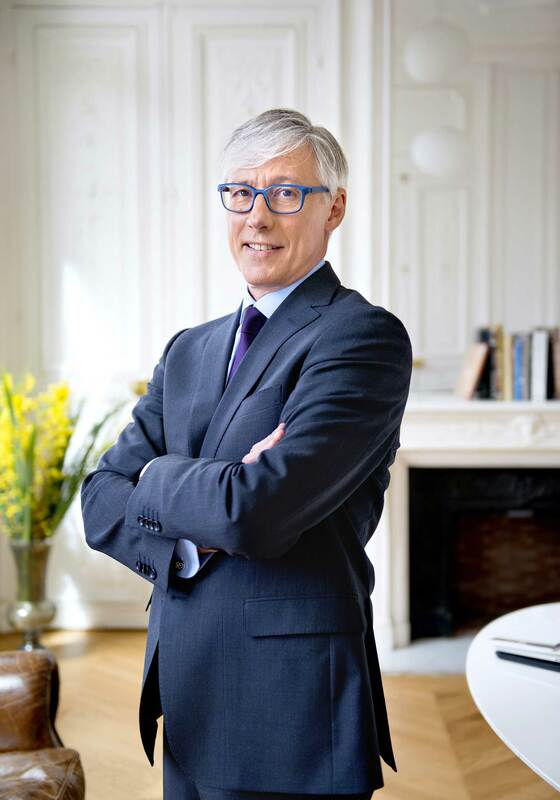 In September, Sanofi and Regeneron announced that the pivotal Phase 3 LIBERTY ASTHMA QUEST study of dupilumab in a broad population of patients with uncontrolled, persistent asthma met its two primary endpoints. Dupilumab, when added to standard therapies, reduced severe asthma attacks (exacerbations) and improved lung function. 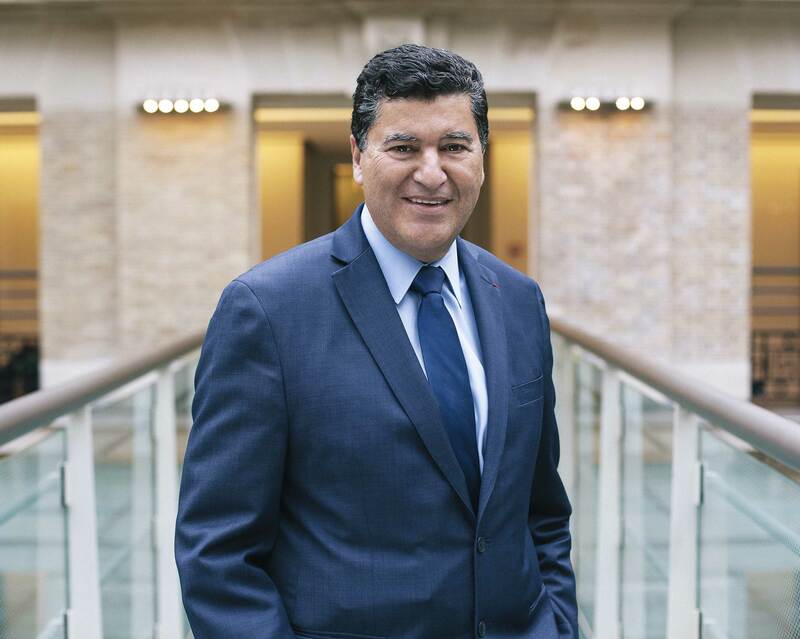 In September, Sanofi alliance partner Alnylam Pharmaceuticals announced that it had suspended dosing in all ongoing fitusiran studies pending further review of a safety event (a fatal thrombotic event occurred in a patient with hemophilia A without inhibitors enrolled in the Phase 2 Open Label Extension study of fitusiran) and development of a risk mitigation strategy. Based on overall consideration of fitusiran’s benefit-risk profile, Alnylam aims to resume dosing as soon as it is feasible upon agreement with global regulatory authorities and with appropriate protocol amendments for enhanced patient safety monitoring in place. SAR341402, a rapid acting insulin, entered into phase 3. Cemiplimab, a PD1-inhibitor, entered in phase 3 for second-line treatment of cervical cancer. In October, positive results from a Phase 2 study of dupilumab in adults with active moderate-to-severe eosinophilic esophagitis were presented at the World Congress of Gastroenterology (WCOG). The study showed that patients who received dupilumab weekly reported a significant improvement in the ability to swallow versus placebo. SAR407899, a Rho kinase inhibitor, entered into phase 2a in microvascular angina. Sanofi decided to stop the development of SAR156597 in Idiopathic Pulmonary Fibrosis. Sanofi does not intend to continue development with, or seek a license from, the Walter Reed Army Institute of Research for the Zika vaccine candidate following BARDA’s decision (Biomedical Advanced Research and Development Authority) to de-scope its contract with Sanofi Pasteur to fund the manufacture and clinical development of an inactivated Zika vaccine. 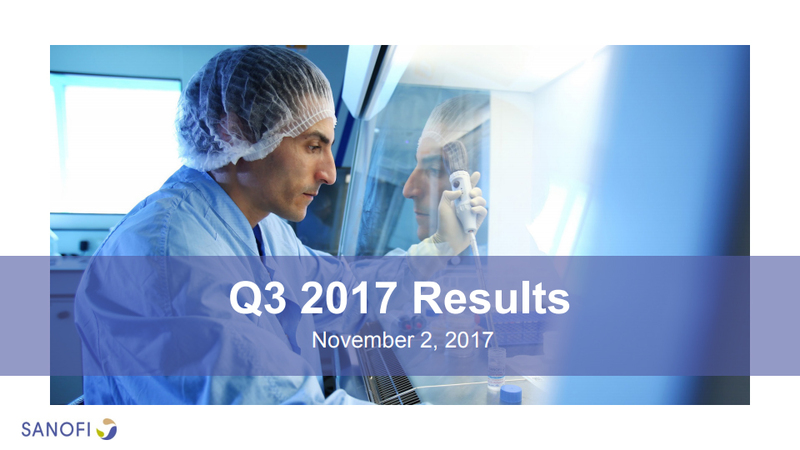 To access the full press release of the 2017 Q3 results, please click here. Sanofi confirms its full-year 2017 guidance for business EPS(9) to be broadly stable at CER, barring unforeseen major adverse events. The currency impact on 2017 business EPS is now estimated to be -1% to -2% if the average September 2017 exchange rates are applied to the fourth quarter of 2017.